The meta title of your page has a length of 45 characters. Most search engines will truncate meta titles to 70 characters. The meta description of your page has a length of 132 characters. Most search engines will truncate meta descriptions to 160 characters. 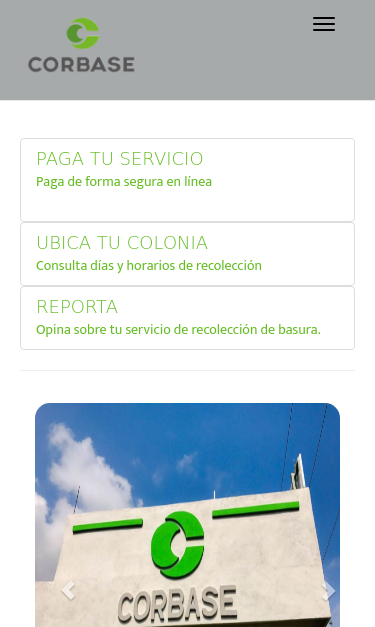 Paga tus mensualidades con tu tarjeta de débito o crédito sin cargo adicional o conoce la ubicación de nuestros módulos de pago. Congratulations! The size of your webpage's HTML is 16.58 Kb and is under the average webpage's HTML size of 33 Kb. Faster loading websites result in a better user experience, higher conversion rates, and generally better search engine rankings. Your webpage doesn't use any HTML compression! You should compress your HTML to reduce your page size and page loading times - this will help your site retain visitors and increase page views. If you were using compression, you could be compressing your HTML size by 76% - from 16.58 Kb to 4.01 Kb . Your website loading time is around 4.28 seconds and this is under the average loading speed which is 5 seconds. Your website is not using cache headers for all CSS resources. Setting cache headers can help speed up the serving of your webpages for users that regularly visit your site. https://www.corbase.com.mx and https://corbase.com.mx should resolve to the same URL, but currently do not.